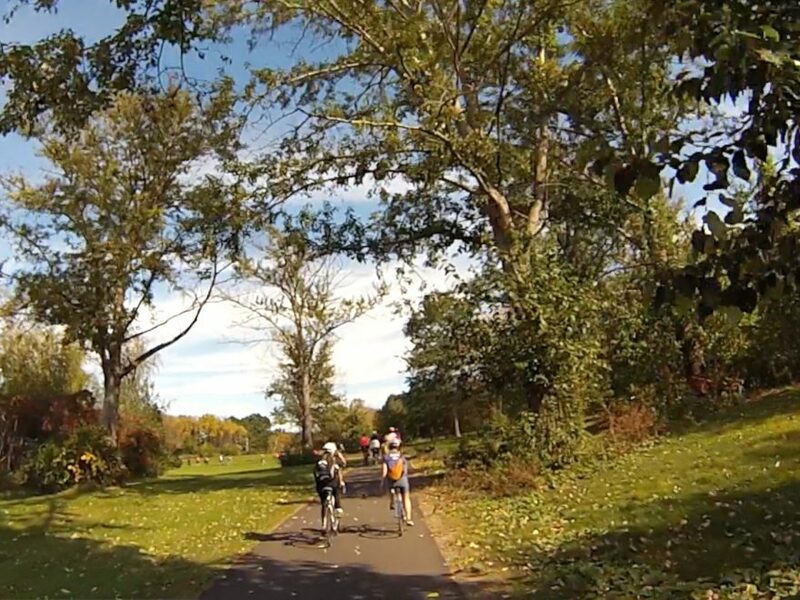 Fall Colors Ride Shows How Trail in Everett Connects to Trails in Medford, Somerville – Bike to the Sea, Inc. This year’s Fall Colors Ride showed how the Northern Strand Trail in Everett connects to trails in Medford and Somerville. Right now the Northern Strand ends in the Village neighborhood of Everett, not far from Teddy Peanut Butter and Night Shift Brewing. However, it’s possible to ride a bike from there, all the way to Assembly Row in Somerville, without having to ride on-street. Instead, bicyclists can ride on a few wide sidewalks and cross over a couple of main roadways to safely arrive at the newly-built shopping mecca on the Orange Line in Somerville. 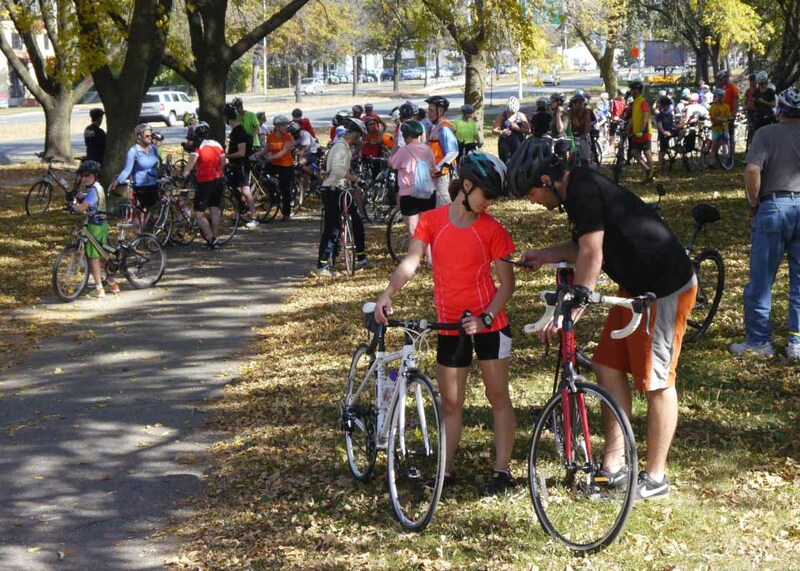 About 100 bicyclists participated in this year’s ride, led by Bike to the Sea board member Peter Sutton on Sunday, Oct. 22. Sutton led the group from Night Shift Brewing to the Northern Strand trail and then eastward towards Malden. The group then took a left on Medford Street, riding on the sidewalk past National Grid and Comcast before taking a left on the sidewalk on Commercial Street. 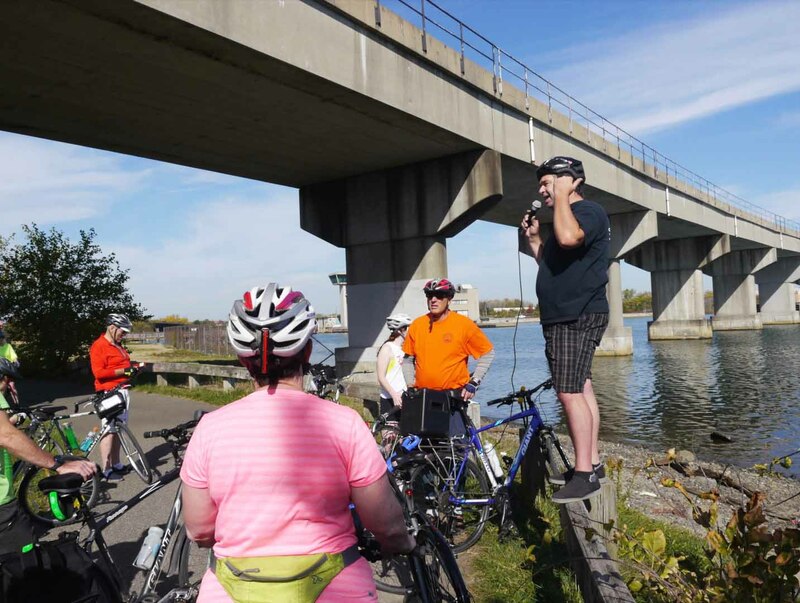 From there, the ride continued down to off-road trails in the park along the Rivers Edge development and the Malden River until it reached Revere Beach Parkway. From there bicyclists rode on newly built wide sidewalks, taking a left under the overpass at Wellington Station. The ride continued through the Wellington Station Parking lot. Behind there it connected to beautiful off-road trails along the river which took the group west towards the Fellsway. From the Fellsway, you can ride over the Mystic River, south towards Assembly Row on the sidewalk. However, before doing that, Sutton led the group across the Fellsway to explore more off-road trails in the park, known as the Mystic River State Reservation. 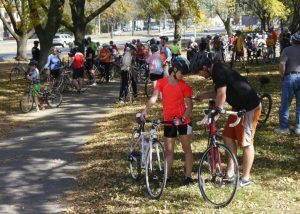 The bright sunny weather, with temperatures in the high 60s, and low 70s, was credited with the record turnout of about 100 riders.